'City' is the second chapter of Devin Townsend's project named Strapping Young Lad. It comes out two years after the debut and leaves you psyched like few albums did before. Moreover, this time we find in the line-up no less than Gene Hoglan. In the end, Stefano Pera has interviewed Townsend and Hoglan, getting a very good impression from them, who'd ever say that? Some people are more difficult to meet than others. It's not due to them, but to the "human" interviewers, who are kind of spellbound in front of talented persons. Gene Hoglan and Devin Townsend are without any doubt two "geniuses", of course not absolutely but in their field, and while the world of metal is living in a state of transition unsure if it's able to go onward (to the unknown) or backward (to the Eighties), this duo surely represents a strong point - that shouldn't go unnoticed. The interview we did is not the kind you would expect. Hoglan and Townsend are in Milan to promote the new Strapping Young Lad record, 'City', but because the two of them are involved in so many projects, we couldn't avoid going inside out through their career. Devin is only 24, but his references are awesome. At just 20, he was requested by Steve Vai, then he made some performances every now and then with people like James Murphy (the singer is the main reason why Murphy's solo album has been so well received), took part in many tributes and formed Strapping Young Lad, one of the most difficult and powerful bands of the planet. 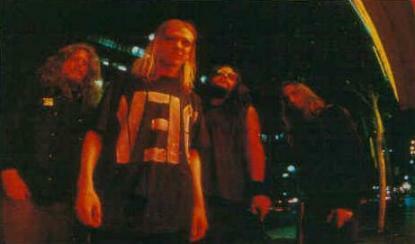 On the other hand, Hoglan was the mastermind of the still-sadly-missed Dark Angel, the right hand of Chuck Schuldiner in Death's period of maturity ('Individual Thought Patterns' and 'Symbolic' are fundamental), has won Metal Hammer '96 Readers' Poll without releasing anything in that year and many drummers (Lombardo, Bostaph, Ulrich...just to mention some unknown ones of them believe him to be a true monster. And now let's come to this album: ok, I've been wrong in the review, 'City' is fantastic, but I kind of needed to listen to it fifteen times to dig it, and there's something not clear yet to me. So, let me correct, giving it a 5,5 out of 6 instead of 3, but beware if you think that going into 'City' is like going into the usual CD...forget it, compared to it, Coroner's records are easy listening. "Yes, perfectly. I've always had a certain idea to get and 'City' is the fulfillment of my dream. I wanted a very hard, modern, technological record...but at the same time it had to be metal, raw, sharp..."
Hoglan steps in: "Yes, the purpose was to massacre the listener, to kill him...Musically, of course. We wanted 'City' to sound more violent and harder than anything else. It had to be different from all the rest and so it is!" Well, don't you think that repressing the rock side of the album with tons of effects and samples, with the vocals being almost a background ....is a bit too much? "(Devin) Yes, but we meant it to be like this. It's been our own choice. When we were done with the mixing the tech came to me and told me 'you have to do it again, the samples are too high and the songs are confused', on the contrary, we absolutely changed nothing, I wanted the album to exactly sound this way." Good, many bands get wrong mixes because of incompetent technicians and don't have a cent to redo the mixing...if it was your choice it's ok to me, but why? Why stifling guitars, drums, vocals for this incredible violence? "(Devin) I played so many stuff, in my life I had the chance to do every kind of music, but Strapping Young Lad is my project and I wanted it to be this: a sonic hell. I've always been into the technological dimension of modern music and one of the things that I would like to do the most has always been pushing boundaries, to go beyond, experiment something new. That's why I wanted this type of record." Could you explain to me why I needed to listen to it ten times to do a bad review, and four or five more to realize I madea blunder and every time I hear it I found something different and new coming out? "(Devin) 'City' is like those fruit juice tins. You buy them and they are as big as the normal tins, you add water and make liters and liters to drink out of it. This album is the same thing, with all we put it in, we'd have done fifteen disks. I'm not exaggerating. Every song is full of ideas...we dared and we have no regrets, really." "(Gene) You can never know what people think about a record and to make a CD for the audience would be a stupid thing. Every musician will tell you the same thing, he plays for himself, the first fan he wants to satisfy is himself, and that's why albums like this exist. We are here because we tried to satisfy our need, we tried to put our idea in practice. When we started working on it, we got so involved that everything that came out had to be in 'City'. We never thought we could not put some part or simplify something...why? Why should we have done it? Devin, who wrote all the music of the record, had his ideas and we were here because we shared them, all we put into the CD is the faithful picture of what we feel inside and it was a great experience." Oh goddamn boy!!! How did you end up working together and how would you describe this experience between two high personalities like yours? "(Gene) He works for an express mail-van and gave me a package...he recognized me and asked me an autograph...Ha, hahahaha, hahaha!" "(Devin) Then I fell to his knees and I was like 'play with me please!' hahahahah, haha, hahaha!" I don't know why I have the strange feeling you're pulling my leg! "(Gene) No...this was a joke...The truth is we have mutual friends who made us meet and pushed us to start doing something together. These persons, who know us well, have realized before we did that we had strong common views and so when the opportunity to do something together came...it came out of the blue, but it worked." "(Devin) Yes...so it happened and at that time 'City' was just a sort of idea, there was nothing to work on. When we met we went to a studio and honestly we really had no idea of what to play. So we jammed and a cool feeling was born, as the record proves very well." Sorry Gene, but first with Chuck in Death and now with Devin in Strapping Young Lad you are in a situation in which there's already a leader, a mastermind of the project... how do you feel personally and artistically about your position as an extra value in this kind of affair? "(Gene) It doesn't cause me troubles. If I have to be honest, I like to play the human drum machine. At a personal level, I get greatly satisfied giving the songwriter the chance to obtain certain things. I see it in their eyes...they have the plan in mind, the idea, that is the most important thing in the songwriting, but it's pretty rare they're drummers or know how to get certain results, so come to me and tell me: 'I want this', 'I'd like it to sound this way'...and when I do they've found the key to fulfill their idea. In this kind of music the dynamic of the rhythm section is basic, a song can have it all or be none if the rhythm section is not ok."
Do you mean this situation already happened? "(Gene) Oh, yeah! With Death, for example. Chuck used to write all the songs and then came to the studio and let me hear them...we started to work...he never told me 'do this' or 'do that', I was completely free to be myself in what I was playing, but I was sure he wanted to have a certain thing for what he wrote and when he saw that my parts perfectly matched with what he had in mind he was always very happy. And me too!" But after all, you were the mastermind in Dark Angel? Do you mean you're happy being just a kind of session man? "(Gene) It's not exact. It's true by taking part of projects born from others' ideas I often have to comply with the instructions of a writer who's not me, but this is not a limitation, I put of lot of myself in what I do, after all I'd never do a record I didn't really like". About participation, collaborations and stuff, you're the drummer on the new Testament, aren't you? "(Gene) Yes, I recorded the drums for the new Testament." What's your role inside the band? "(Gene) I have no role 'cause I'm not part of it. My work is about what I've just told you. They needed a drummer for the album and I was free and so I participated, but I'm not 'the new Testament drummer'. There too, I went to the studio to help them to achieve what they wanted. The main songwriter, Eric Peterson, explained to me what he wished and I did it. That's all." "(Gene) Now my main commitment is Strapping Young Lad. We'll be soon on tour, and I think we'll come to Italy too. Then we'll see. With Devin and the other guys we'll be busy for about three of four months, after that I don't know yet what I'm gonna do." Devin, coming again on Strapping Young Lad and touring, what's the future of the band? "(Devin) Strapping Young Lad is not a band like others, with a constant life...it's more of a project I need when I want to do this kind of things. I don't like to keep doing the same thing for a while, it's restrictive, I like to explore and so I need more dimensions to move in." The band is made of four. What's the share of the other guys in the album? "(Devin) Though it seems a temporary act, Strapping Young Lad is a real band, what you hear on the CD is the work of four musicians, each one with his own perspectives and identities. It's true the idea is mine, but without them I couldn't ever get this offspring." "(Devin) Never had any problem. Although I'm quite young I have already a lot of experience behind me and this allows me to deal every situation with serenity. I never felt embarrassed or scared by such persons. If I was there , there should have been a reason. A bit immodestly, I'm sure enough of my talent..."
Don't worry, we all think you have lots of talent! "(Gene, to Devin) No doubt on it, he owns a huge load of talent!!!" "(Devin) Thank you, thank you very much, this means a lot to me." "(Devin) Collaborating with Vai was a sort of prostitution...I wasn't really happy with the genre or the record, but I was asked to sing and this was a big chance for my career, but I believe I was just a singer 'for rent'. About Murphy, I didn't even realized I participated...I came, listened to tracks, recorded my stuff and after an hour I was already out." "(Devin)Yes, I recorded the two songs in an hour, but it's not my best... to do the vocals on the Rush tribute I was done in less than fifteen minutes." That's real talent. How many can say to have done a recording this fast and marked the final product so much? Only a big artist can impose his identity in big things as well as in little. "(Devin, blushes again) Thank you once more." Devin, you're not only a singer, but you are able to play many instruments. How much does this influence your songwriting? "(Devin) I don't know, it's quite natural to me. When I start writing a song or I have an idea, I use every instrument that can help me to achieve my goal." "(Gene) It's true, I can play by myself the tracks I wrote with a guitar, it's very important doing things from different views...it helps to have the ideas clearer and get a better outcome." Being here, Gene, I told you that you have won the Metal Hammer Readers' Poll as best drummer...and that's strange, there's been nothing with you on out in 1996. "(Gene) Great! I'm very happy, I didn't release anything in '96. I just recorded something with Testament and Strapping Young Lad, but it's gonna be out in '97. I'm really happy, I didn't expect...who's left behind (smiling with pleasure)?" Cavalera, Portnoy, Ulrich and Lombardo... enough? "(Gene) Lombardo??? Portnoy??? Jeez, you really gave me a kinda big present!" "(Gene) 'Time Does Not Heal'? It's crazy, that record was the ruin of Dark Angel." What? There are a lot of people over here (Italy), who think it to be a cornerstone. "(Gene) Yes, but in the rest of the world it wasn't understood, unluckily. The most I'm sorry about is that we couldn't release the next record, that would have marked a new turning point, a new frontier. The album after 'Time Does Not Heal' should have made by more in-your-face, short, but still very powerful songs. It's a shame"